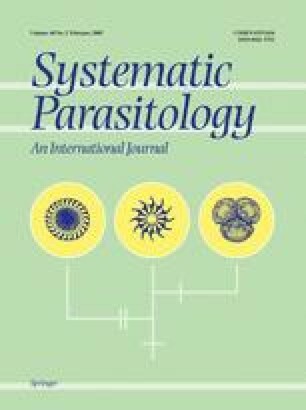 A review of the largely confused Amblyomma maculatum Koch, 1844 tick group of the subgenus Anastosiella Santos Dias, 1963 (A. neumanni Ribaga, 1902, A. maculatum, A. parvitarsum Neumann, 1901, A. tigrinum Koch, 1844 and A. tristeKoch, 1844) is presented together with a discussion of the diagnostic characters used for the determination of adults, nymphs and, to a lesser extent, larvae. A key for this tick group is produced, including the description of the larva of A. parvitarsum, 1901. Sequences of 16S rDNA are obtained and compared with other Amblyomma spp., including two other species currently in Anastosiella but in the ovaletick group, A. ovale Koch, 1844 and A. aureolatum(Pallas, 1772). According to the morphology and the rDNA sequences, the maculatum group is reduced to A. maculatum (Neotropical-Nearctic), A. tigrinum (Neotropical) and A. triste (Neotropical) A. neumanni and A. parvitarsum are excluded from the subgenus. The distribution is sympatric in northern South America from where A. maculatumreaches the southern Nearctic and the range of A. tigrinum extends to the southern Neotropics. These species have been found on several domestic and wild vertebrates. A. triste and A. tigrinum have been also found on man. Their role as vectors of pathogens deserves further investigation.